Frankfurt, 1646. 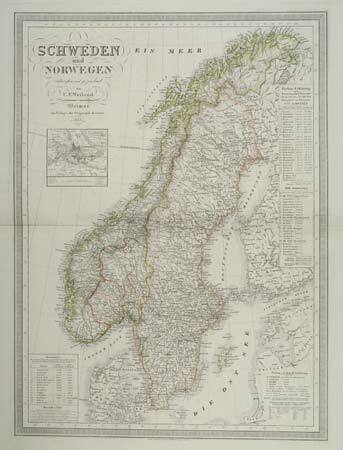 Decorative map of Scandinavia, with a large title cartouche. Paris, 1748. 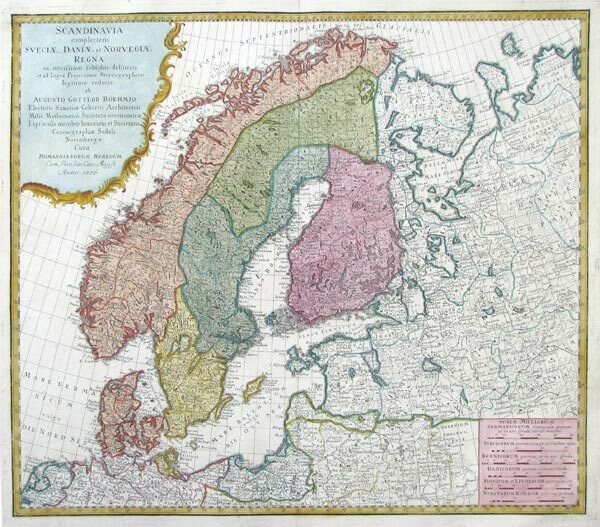 Robert de Vaugondy's smaller format map of northern Scandinavia. London, John Harrison, 1788. 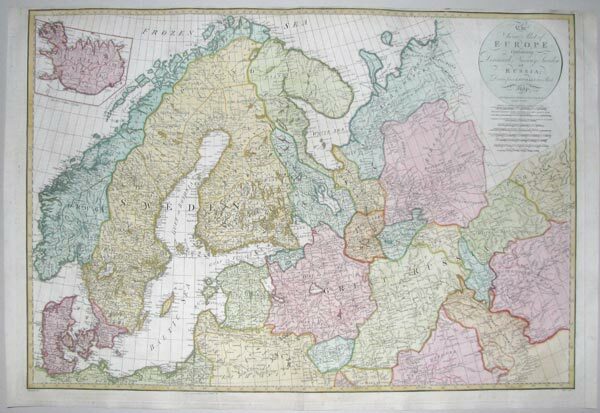 A large and colourful map of Scandinavia, the Baltic and Russia. Iceland appears in an inset. London, Cadell & Davies, 1809. 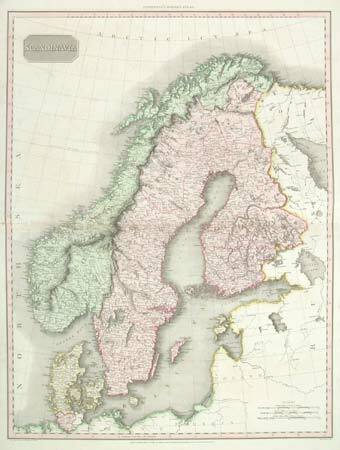 Large and detailed map of Scandinavia, with strong original colour. London, J. & F. Tallis, c.1851. 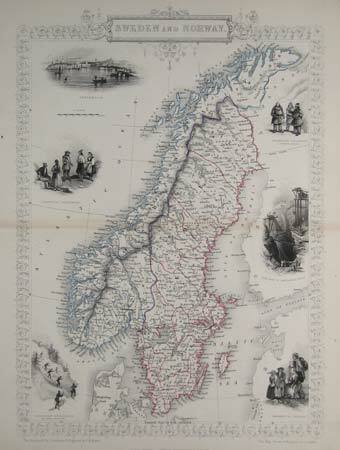 With inset vignettes including views of Stockholm and skiing. Paris, 1759. 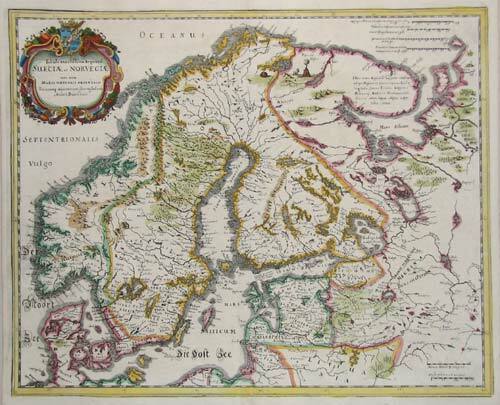 Map of the southern part of the Gulf of Bothnia, between Sweden and Finland, marking Stockholm and Uppsala, Turku (Abo) & Uusikaupunki (Nystad). Amsterdam, Jansson van Waesburg & Moses Pitt, c.1680. Southern Jutland, decorated a fine title cartouche. 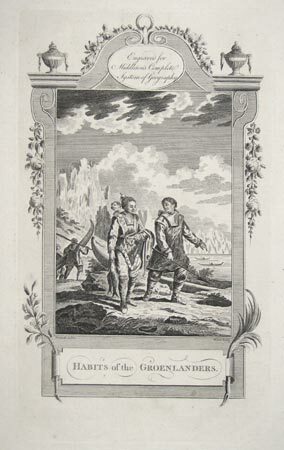 This example comes from an uncommon collaboration between Jansson's Dutch successors and Pitt, a London publisher. 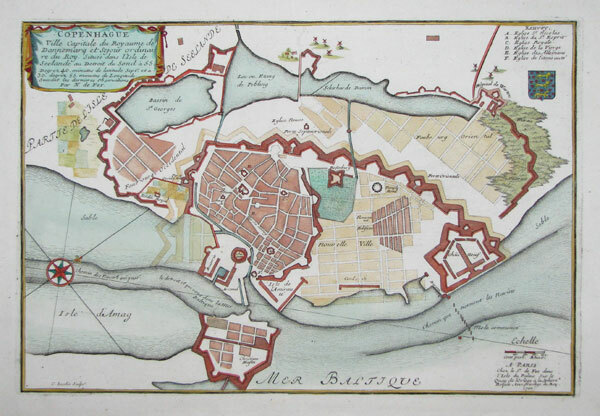 Frankfurt, 1686. 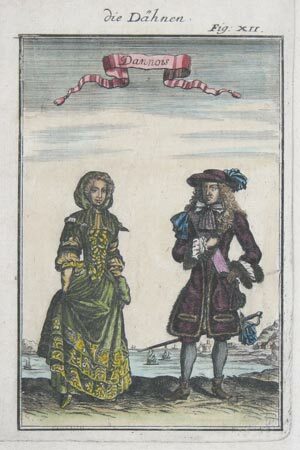 A Dane and his wife, from a German edition of Mallet's 'Description de l'Univers'. Amsterdam, c.1690. 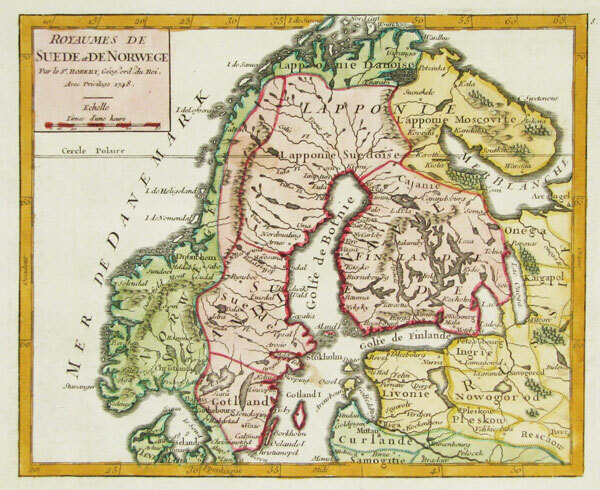 Northern Denmark, with fine title and scale cartouches and scale cartouches in full colour. Augsburg, c.1770. 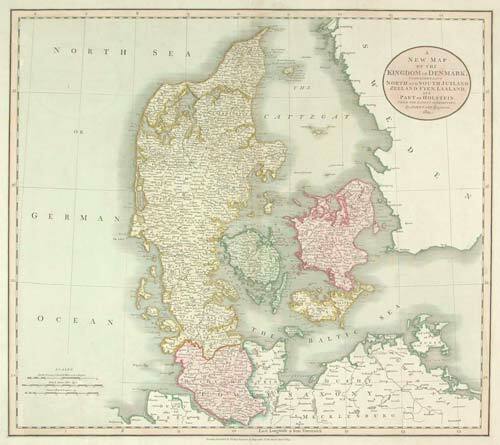 Denmark map, with Sleswig-Holstein and the southern reaches of Sweden. Edinburgh, c.1814. 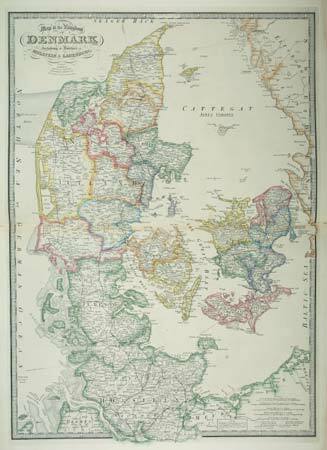 Denmark, including Schleswig & Holstein, with insets of the Faroes and Iceland. London, 1819. 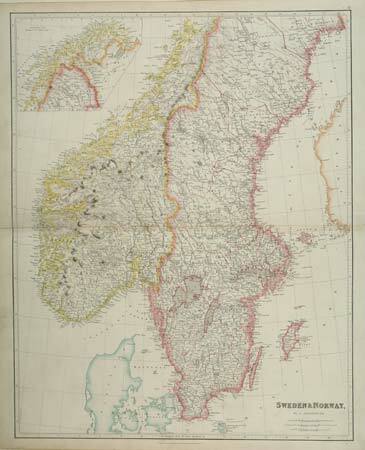 A detailed map, in fine colour. London, 1842. 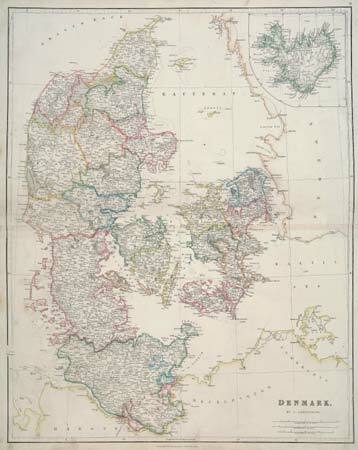 Detailed map of Denmark, issued in the 'London Atlas' by the foremost British cartographer of his generation. 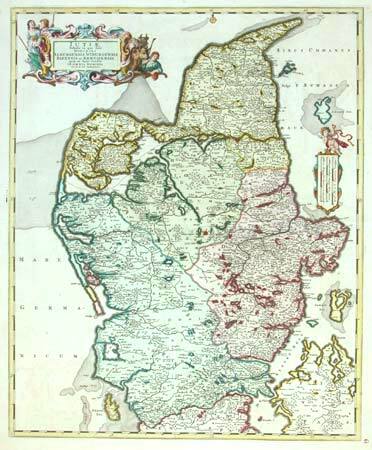 Schleswig & Holstein are still part of the country. London, c.1872. A large and colourful map. Paris, 1700. Plan of Copenhagen. Paris, c.1683. An Inuit couple and child, wrapped in furs. Underneath is a scene of a Inuk in a kayak about to spear a seal. London, c.1780. 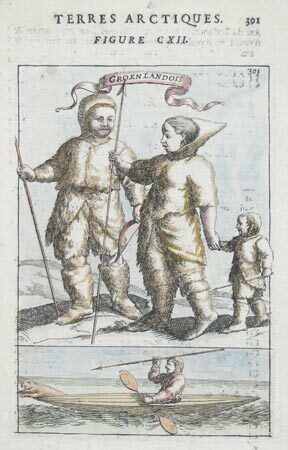 The Inuit of Greeland, within a decorative engraved boder, published in 'Middleton's Complete System of Geography'.